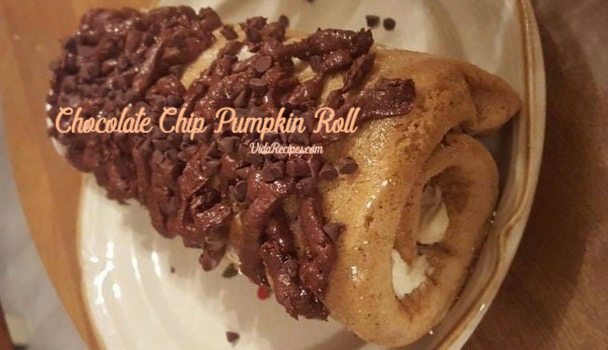 A delicious fall treat that’s also perfect for the holidays! Who doesn’t love the amazing taste of pumpkin? Preheat oven to 375. Line a baking pan with parchment paper. Mix eggs, sour cream, sugar and pumpkin together in a mixing bowl. In another bowl, stir the flour, baking powder, salt, ginger, cinnamon and nutmeg together. Take flour mixture and add to mixing bowl slowly, on medium till all incorporated. Pour mixture on baking pan, spread out and bake for 15 minutes. Take a clean dish towel that is the size of the cake. Cover with ½ cup powdered sugar. When cake is done and cooled for about 2 minutes. Removing from pan lay cake onto the dish towel. Starting at one end, roll the cake into the dish towel. Place in refrigerator to cool for an hour. Prepare filling by mixing butter, cream cheese, sugar, and vanilla together. Stir in chocolate chips. Take the cake roll out of refrigerator and unroll. Spread icing onto the cake. Then, roll the cake back up without the dish towel and refrigerate for 1 hour or until ready to serve. When ready to serve, melt 1 cup of mini chocolate chips over a double boiler. Spoon melted chocolate into a piping bag to pipe decorations. Sprinkle with mini chocolate chips. ENJOY!